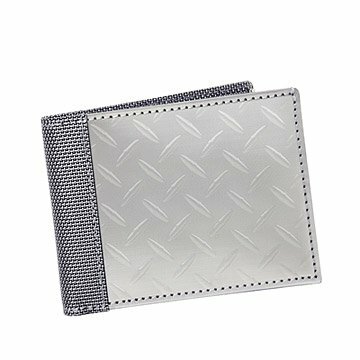 This woven stainless steel wallet is for men looking for something extraordinary. Used by astronauts, architects, and surgeons, the signature stainless steel material used in these wallets was included in the exhibition "Extreme Textiles" at The Cooper-Hewitt National Design Museum. That should tell you that this is no average wallet, but a reinterpretation for men looking for something extraordinary. It's also a great option for the security-conscious because it blocks unauthorized transmission from RFID-enabled credit cards and IDs, helping to keep your stuff safe from identity theft. With three credit card slots, an ID window pocket, and bill compartment, it keeps everything organized in an industrial-inspired package featuring a diamond deck plate texture. Designed by Theo and Paul Stewart-Stand and Penelope Mahot; made in India. Designing trio Theo Stewart-Stand, Paul Stewart-Stand, and Penelope Mahot strives to combine sophisticated design and packaging with unique materials and functional objects. Theo received his Bachelor's degree in Fine Arts from The Cooper Union in New York City. His major was graphic design, but he always wanted to explore and design three-dimensional forms. "I like to recreate pre-existing functional objects. In some ways it is like being a chef with durable products." If he weren't a designer, he would be an engineer. Theo's brother Paul received his Bachelor's degree in Economics from Union College and a Master's from the London School of Economics. He has an entrepreneurship spirit and says that if he wasn't a designer, he'd be a scholar. Penelope is a French-American still life photographer. She graduated from Parsons School of Design with a Bachelor's degree in Fine Art photography. She oversees the Stewart-Stand brothers' visual concepts and is responsible for day-to-day operations. Clean with a soft, dry jewelry polishing cloth. Really nice gift it felt really special above normal. It did cost a bit more than most wallets I would purchase but hey someone that can buy want they want it was worth it.